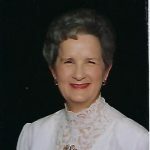 Kay Connelly Mayton, 85, passed away on Tuesday, January 22, 2019. Kay was a native of Prosperity, South Carolina and a peninsula resident since 1971. Kay was preceded in death by her parents, Elois Hoffman and M. Pettus Connelly, Sr. a brother Marion P. Connelly, Jr. and a niece Diane Connelly Hunt. She is survived by her husband of 60 years Wilfred Morton Mayton, Jr. a son Michel Quinn Mayton and his wife Cheryl Baker Mayton and a daughter, Kay Behre Mayton Callis and her husband Wayne and a sister Betty Sue Connelly Hill and her husband Frank P. Hill, Jr. . She is also survived by her grandchildren, Meleah Quinn Mayton, Cathy, Scott, Ryan, Dane Callis and a sister –in-law Mary Monroe Connelly and numerous nieces, nephews, and cousins. A memorial service will be held at 11:00 AM on Monday, January 28, 2019 in Crooks Memorial United Methodist Church. Burial will be at a later date in Zion United Methodist Church Cemetery in Prosperity, South Carolina.